Outlast DLC Promises All-New Horror "Fun"
The team behind the horror hit Outlast isn't done with you yet. I don't know if this qualifies as "good news" or not but it's something that's happening, and something that an awful lot of us are likely to voluntarily inflict upon ourselves at one point or another. 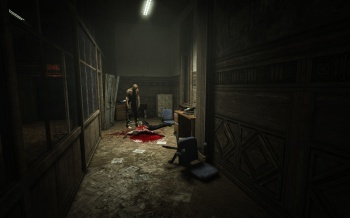 I'm talking about DLC for Outlast, the indie horror hit set in an abandoned insane asylum, which developer Red Barrels announced today is in the works. "We've gotten a ton of good feedback from Outlast players and one thing is clear," said Red Barrels co-founder Philippe Morin. "People want us to keep trying to scare them! We're more than happy to oblige." Red Barrels didn't reveal any details about what the DLC will contain, saying only that it will feature "a new protagonist and storyline through which players can further explore the terrifying secrets that lie at the heart of Mount Massive Asylum." More information will be revealed on October 31, appropriately, and in the meantime those who haven't yet sampled the sweet awfulness of Outlast may take advantage of a 33 percent off sale currently running on Steam, GOG and Gamersgate.